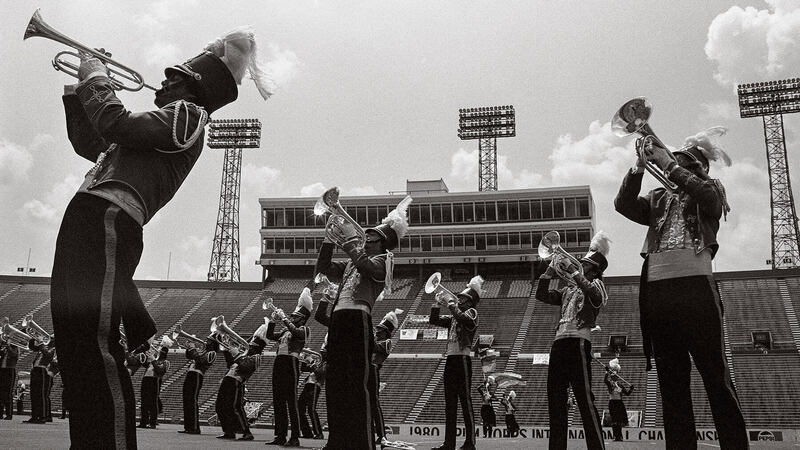 The 1980 DCI World Championships returned to Legion Field in Birmingham, Alabama, with the most competitive run for the title yet witnessed in DCI’s history. While the Blue Devils repeated as Champion, the 27th Lancers came within 0.35 points of earning the first DCI title by an eastern drum corps. Blue Devils’ winning show started with DCI Hall of Fame member Wayne Downey’s “New York Fantasy,” originally written by the corps’ young horn arranger as a full-length tune. However, only the opening fanfare made it to the field. Those who were curious about the rest of the piece were able to hear the entire selection on the LP sent to tens of thousands of high school band directors by Jenson Publications, now part of Hal Leonard. 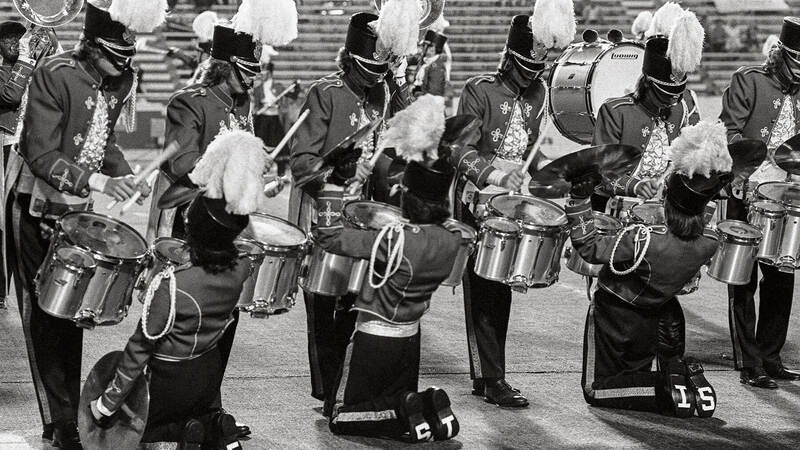 Downey had created a new series for the fledgling company that he titled, “State of the Art,” which included a number of selections he had written for Blue Devils. He shared the album with arrangements by then-South Carolina high school band director Jay Bocook, who went on to arrange for Spirit of Atlanta and the Cadets. The fanfare segued straight into Sammy Nestico’s “Ya Gotta Try,” a hard-swinging tune off Count Basie’s 1977 “Prime Time” album, which won the Grammy Award for Best Jazz Performance. Nestico had composed all the selections on the album except for his arrangement of “Sweet Georgia Brown,” which also found its way onto the drum corps field via Spirit of Atlanta. Just for the last 20 seconds of the movement, the Devils’ color guard introduced a piece of equipment they named “whoop-de-doos” that hadn’t been seen on the drum corps field before. When spun and tossed, the pole with long, thin wisps of metallic fabric streamers attached to each end created an impression of circular apparitions flitting through the air. Robert Lamm’s “Free” was written for the “Chicago III” album of 1971 before being arranged by Bob Curnow for Kenton’s first large-scale jump into the music of rock bands. That 1974 “Kenton Plays Chicago” album, was one of the first recorded with DBX noise reduction, and it is now considered a pioneering example of jazz-fusion, a term not widely known back then. Although it seems tame today, the drill move during this section of the Blue Devils’ program (showcased in the video clip), where the two circles of brass players back up and then seamlessly merge into the moving arcs of mid-voice brass, was at the time a radical maneuver. The next segment of this production was “La Suerte de Los Tontos,” a movement from Johnny Richards’ “Cuban Fire Suite,” off Stan Kenton’s Mellophonium Orchestra album of 1956, titled “Cuban Fire!” The title of the piece means “Fortune of Fools” or “Fools Luck.” The work of Johnny Richards and that of the Mellophonium Orchestra has been performed a number of times in the history of Drum Corps International, perhaps most notably by the 1986 Suncoast Sound. The corps’ closer of “Dindi” transitioned out of the Vanelli piece. Brazilian songwriter Antonio Carlos Jobim wrote the bossa nova melody for singer Sylvia Telles, whose nickname was Dindi. Tragically, Telles was killed in a car accident in Brazil shortly after the 1966 recording session. A closing tag had the two sides of Blue Devils brass players pivoting into a single company front as the entire color guard traced designs in the air with maroon rhythmic gymnastic ribbons. The horns advanced and passed through the guard section, with subtle screeching hints of “New York Fantasy” closing out the show. For this week only, you can save on the Legacy Collection DVD that contains this complete Blue Devils performance, along with all finalists from the 1980 DCI World Championship. Discount DVD offer ends Monday, June 8.